Basic principles. Diseases. Special topics in ophthalmology. Clinical decision-making. 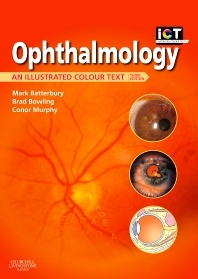 Presents the core knowledge of ophthalmology and disorders of the eye, with a wealth of friendly features and superb illustrations. Relates structure to function in accordance with the approach that most of today's courses take. Tackles the common difficulties of diagnosis and management, such as acute red eye, sudden vision loss, and spots before the eyes, in the clinical decision-making section.